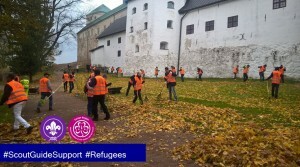 Scouts and Guides contributing to refugee support activities in their local communities in Europe (29): a story from SP-FS- The Guides and Scouts of Finland. The amount of asylum seekers have increased rapidly in Finland during autumn 2015. Although this situation is global and well-known still the numbers were a surprise and many temporary accommodation facilities were quickly established. In the cooperation with local Red Cross and the Parish union the local Guide and Scout district has organized voluntary-based help at the temporary accommodation facilities. Guides and Scouts have organized trips, taught basics of the Finnish language, helped with the donated clothes etc. Hygienic packs including toothbrush, toothpaste and soap were also collected. The planning of how Guides and Scouts can help and activate immigrants in social integration has started. However, more coordination with local Guide/ Scout groups, municipalities and other organizations is needed. All Guides and Scouts future actions will continue to be voluntary based and free for all to join in.